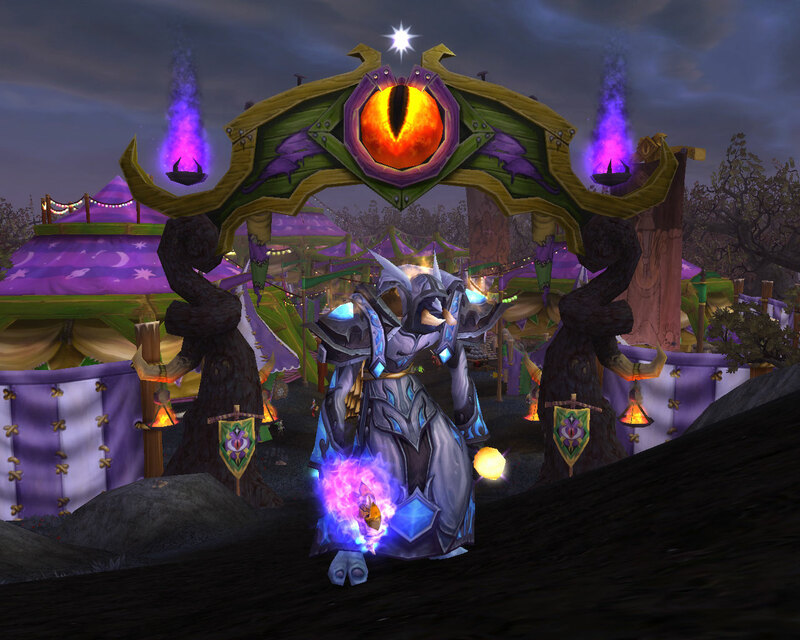 The Darkmoon Faire was only recently revamped, and it’s much more fun and impressive now. I was very excited for the first few months, but its attraction is already wearing thin. I’ll most likely stop caring about the dailies once I purchase all the mounts and pets. Luckily, there are a few things that Blizzard could do to improve the Darkmoon Faire even further. First and foremost, the faire needs more games. If the size of the island and “under construction” tents are any indication, Blizzard plans this as well. However, players will eventually tire of these games as well. Right now, the Darkmoon Faire is exciting because of its limited availability. It can only be accessed one week per month, making it more shiny and new when it’s around. This should be taken a step further. Every month when the Darkmoon Faire is available for a week, it could feature five random games of the pool of 10 to 15. The five wouldn’t change over the course of the week, but next month they could be different. Because it’s different, it’s unlikely that on the second month it would be a brand new five. This would definitely keep the Darkmoon Faire fresh. As the number of total games grew, the amount offered per week could also increase. If there were 30 games total, maybe the faire would feature 10 every week, allowing you to do 10 dailies each day. Next, the games need to be actual games and not just quests. They seemed like games at first, but there’s no way to know if you’re doing better than last time. The game should track your high score. It’s Hammer Time; He Shoots, He Scores! ; and Tonk Commander could each track how long it takes you to finish the game. Target: Turtle could track how many tosses it takes you to get three to land on the turtle. The Humanoid Cannonball could, I suppose, the number of shots out of the cannon you use. If this system was introduced, it would give players a fun reason to continue trying these games – to beat their previous high score. Lastly, I think the daily system should be changed. Really this is something I’d like to see everywhere, but I’ll take it as a change to the Darkmoon Faire. Each day you should be allowed to complete each daily once for free. Each week (that the Darkmoon Faire is open) you should be able to complete each daily seven times. After you’ve used your free play, you could use a “Darkmoon VIP Card” to play the game again. This would still count toward your weekly limit. We’ll examine how that would work. Let’s say I can play every day that the faire is open. I would simply play each game on each day, and it would be exactly like it is currently. Now let’s say I can play only on Tuesday, Wednesday, and Thursday. Tuesday and Thursday I can only play for a short period of time, but I can play all day on Wednesday. In this scenario, let’s say I play It’s Hammer Time once on Tuesday. That would use one free chance at that daily for that day and bring my weekly total for that daily to 1/7. (To be clear, the totals would be per daily. The other games have their own total and daily freebie.) On Wednesday, I have a lot of time to play. I play it once to use my free chance. That makes me weekly total 2/7. Then I play it another four times, using four Darkmoon VIP Cards. Now my total for the week is 6/7. Why didn’t I play it a seventh time? Because I can still play for a bit on Thursday, so I might as well do it without using a Darkmoon VIP Card. On Thursday I go ahead and play the game, using my free chance. Now the total is finally at 7/7. Even if I suddenly find myself with free time on Saturday, I wouldn’t be able to play that game again. Obviously I’m inspired by the “daily” heroic, which is now simply a bonus for the first seven of the week. However, I’ve made a change. Blizzard wants people coming back to play repeatedly. My Darkmoon VIP Card system encourages players to play daily to avoid using Darkmoon VIP Cards, while still allowing people who don’t have time to play daily the opportunity to get their total amount of tries into a limited game time. There’s still the question of how Darkmoon VIP Cards are earned. They could be awarded randomly on completion of the games, awarded absolutely each time a certain score is beat in certain games, or sold for gold. They could even be purchased with prize tickets, although I’m not sure how I’d feel about that. I love the Darkmoon Faire. I love the feeling fun and mystery. And I don’t want that feeling to go away. I want to like and enjoy the Darkmoon Faire. The Darkmoon VIP Card would be a large change to the system. More games would take more development time. However, surely the high score system couldn’t be that much work. Add the high scores into our characters’ statistics page! The timed games would be easy! I think there would have be a steeeeep price on the VIP cards, which means only players with gold or who played a lot already would get them. Which kind of defeats the purpose of getting people to play more. Thanks for the feedback. As you might have guessed, I don’t usually have the time to play daily, which is why I’d like this type of change. I definitely wouldn’t want them so expensive that people couldn’t use them. Maybe it could be simplified to awarding you a Darkmoon VIP Card each time you beat a specific score in a game. If we assume you’re really good and RNG never goes against you, it means each time you use a VIP Card you earn one back as well. If you place the threshold at the right spot, you could have people who’ve figured out how to perform well in the games usually getting another card, but sometimes not. This will still force them to sometimes run out. I’ll have to think about it more!